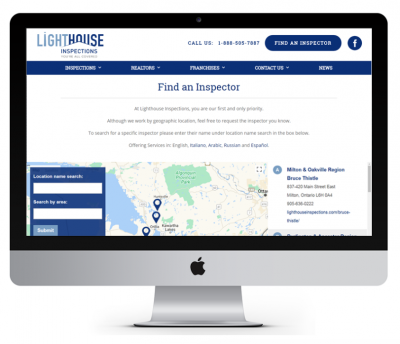 Sprout has recently finished a strategic rebrand for residential and commercial inspections leader Lighthouse Inspections. Lighthouse has more than 17 years of experience in residential and commercial property inspections. The company has completed over 37,000 inspections and has over 50 locations. Their existing brand was dated, messaging did not resonate with their three target audiences – residential, realtors and franchises. The website was also not mobile friendly and did not make it easy to find an inspector. Custom built inspector locator that is searchable by geographical name and region. This project included consumer and industry research which resulted in a new logo, messaging and creative. After completing a brand and competitive analysis, Sprout developed messaging and positioning for each of the three Lighthouse target audiences. Sprout then designed and developed an SEO friendly, mobile-responsive website to better encapsulate the customer experience and reflect the brand strategy findings. Sprout custom-built a responsive ‘Find an Inspector’ page that is searchable by both geographical name and region. We also designed the website so that each inspector can market their services by regional pages. See how we did it here.